The year 2018 has witnessed some great ATP matches yet again. And it wasn’t our favourites that caused a stir each time. In a match someone has to win and someone has to loose. It is when you least expect your favourite player to loose is when you know the extent to which you underrate other players. Here, at EssentiallySports, find out some new names and some old ones that were responsible for a few upsets caused this year. 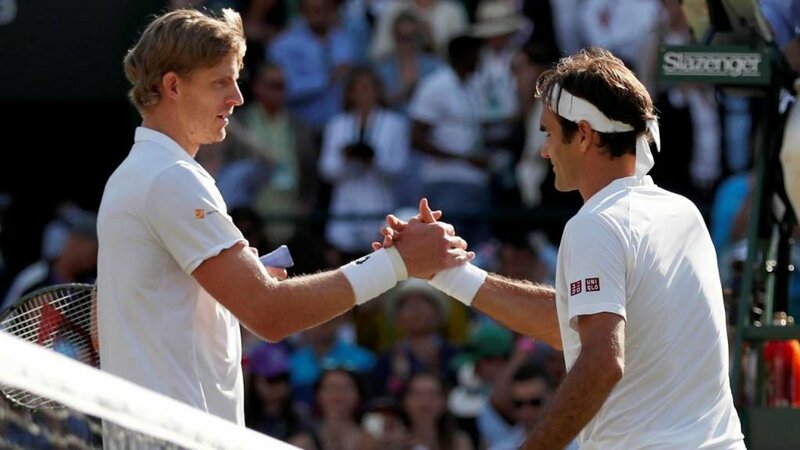 Roger Federer’s quest for a ninth Wimbledon singles title crushed as the 36-year-old Swiss was beaten 2-6, 6-7, 7-5, 6-4, 13-11 by South Africa’s Kevin Anderson. It was Federer’s 16th Wimbledon quarter-final and it lasted 4 hours and 14 minutes. Eight-time champion Federer has already won more Wimbledon singles titles than any other man, but was aiming to equal Martina Navratilova’s all-time record. 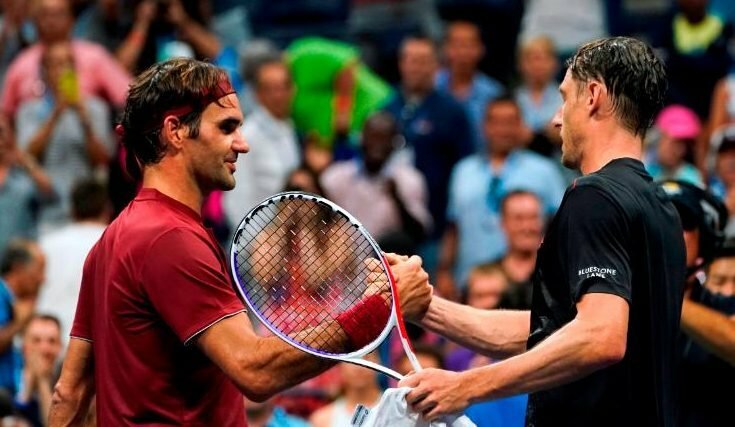 Federer had cruised through the first set in just 26 minutes, taken a two-set lead and forced a match point in the third set, but Anderson was undeterred and closed out victory with the only break of the deciding set. Throughout the final set, Anderson kept up the unerring accuracy on his serve, not offering up a single point for Federer to break. Stefanos Tsitsipas, 19, recorded the biggest ATP win of his career to knock Djokovic out of the third round in Toronto this year. Tsitsipas upset Novak Djokovic 6-3, 6-7 (5), 6-3 in a thrilling encounter between the young emerging tennis star and the reigning Wimbledon champion, that lasted 2 hours 16 minutes. It was the first time that the players played each other. During the tournament, Tsitsipas became the youngest player to record four top ten wins in a single event, defeating No. 8 Thiem, No. 10 Novak Djokovic, No. 3 Alexander Zverev and No. 6 Anderson in succession. “I felt confident with my game. And I knew he had some issues in some particular shots in his game, I would say. 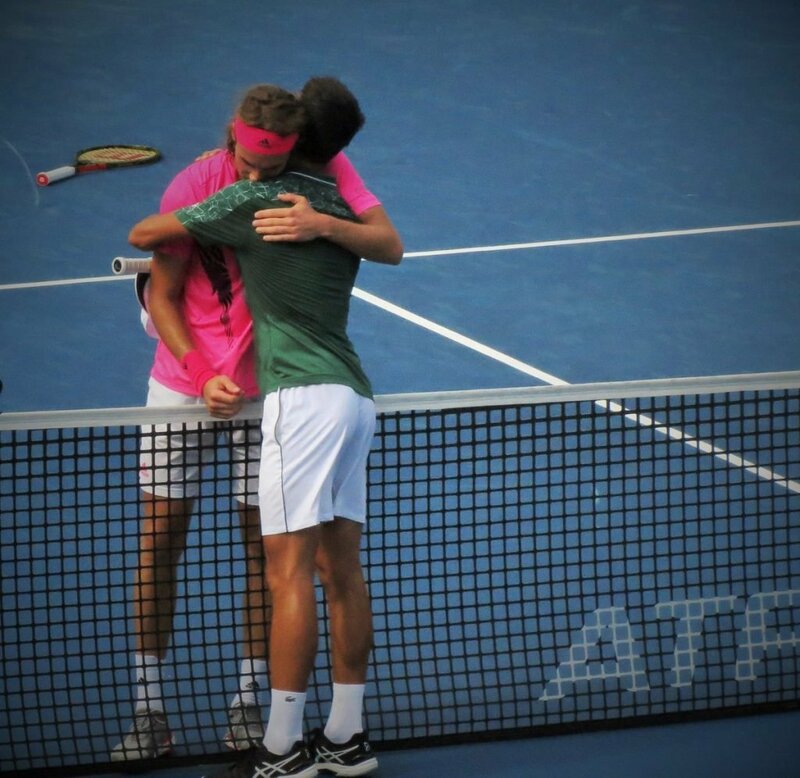 So I was waiting and, like, I grabbed him like a bulldog and stuck there and executed – yeah, I executed my plan”, remarked Tsitsipas after the ATP win. “I knew that at some point he’s going to break, and I just patiently waited for this moment and it happened. 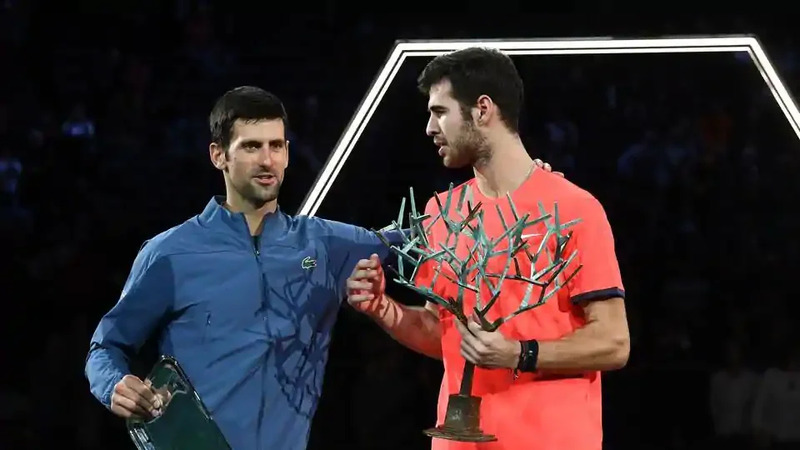 Karen Khachanov sprung a major surprise in the final of the 2018 Paris Masters by beating Novak Djokovic in two sets. The Russian ended the Serb’s impressive 22-match winning streak, beating him 7-5, 6-4. Khachanov bagged his first Masters 1000 title with this win. 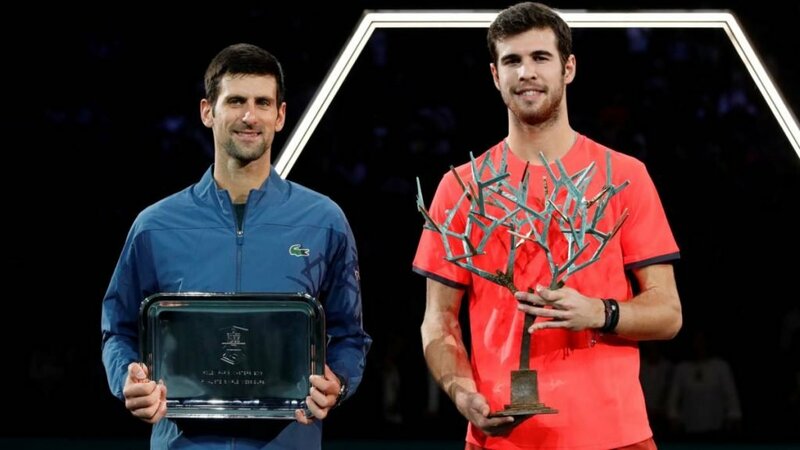 He denied Djokovic a fourth title in a row ahead of his return to world number one. Djokovic made a strong start in his pursuit of a record-equalling 33rd ATP Masters title as he broke for a 3-1 lead in the opening set. The unseeded Russian then broke Djokovic for a 6-5 lead and eventually serving out to take the set. The Serb began to look weary as he dropped serve to a fall behind early in the second set. Khachanov played impressively in the second, grabbing an early break, nearly doubling up and holding his nerve to close things out. “It’s one of my biggest titles so far, biggest achievement. And in general, it’s a breakthrough season,” said Khachanov. The 37-year-old Swiss was all set for a sixth title at the Flushing Meadows but was beaten 3-6 7-5 7-6 (9-7) 7-6 (7-3) in three hours 35 minutes at the hands of the Australian John Millman. 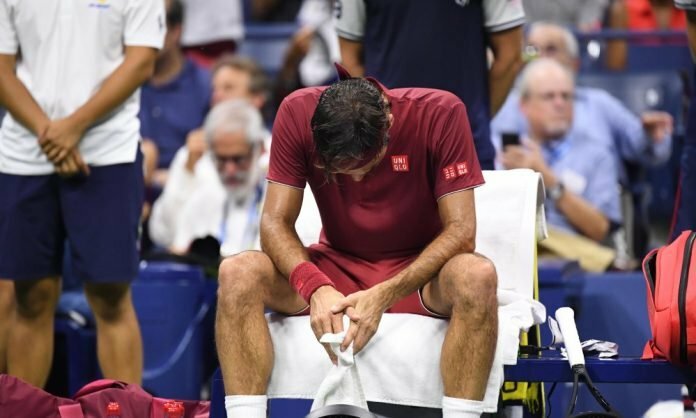 It was Federer’s first defeat in 41 matches at the US Open against a player ranked outside the top 50. On the other end, Millman has never beaten a top-10 player before in his career. Federer made 77 unforced errors in the ATP match. He also made 10 double faults, making it his second highest at the US Open and joint third at a Grand Slam. Also, 49% of first serves landed in, his second lowest percentage in 98 US Open matches and fifth lowest in 393 Grand Slam matches, making it his one of the worst serve performances ever. 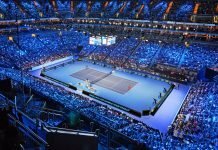 Federer, who is known for his composure, was flustered throughout most of the match as he complained about crowd noise and became unusually vocal during some tense moments. “It was very hot and one of those nights where I felt I couldn’t get air,” Federer said. “I just struggled in the conditions and it was one of the first times it has happened to me. You just keep sweating and lose energy. At some point I was just happy the match was over”. Dominic Thiem ended Rafael Nadal’s 21-match and 50-sets winning streaks on clay at the Mutua Madrid Open. In addition to that in addition to that Thiem ended Nadal’s six-week reign at No. 1 in the ATP Rankings. Thiem played with great discipline and capitalised on a number of errors from the five-time Madrid champion to seal the match 7-5, 6-3. This came after Nadal had already beaten Thiem 6-0 6-2 at Monte-Carlo. “I had to play an extraordinary match, and that’s what I did,” said Thiem. 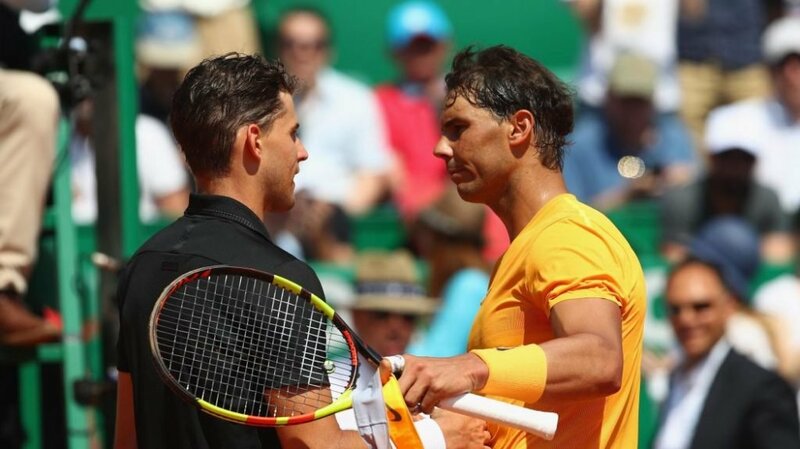 “It takes a really good match to beat Rafa on clay, but I think a very important thing was that I went in with the attitude that I can beat him. Obviously, two weeks ago in Monte-Carlo, he killed me love and two. It was very important I went into the match with a positive attitude, with an attitude to win.